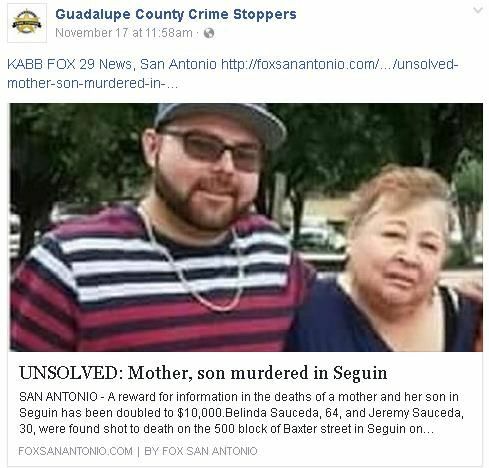 SEGUIN, Texas – The Guadalupe County Crime Stopper`s reward in a recent double homicide case has been increased up to $15,000.00 cash for information that leads Seguin Police to an arrest or indictment. The double homicide remains under investigation by the Seguin Police Department. If you have information on this case, please call the Guadalupe County Crime Stoppers tip line at 877-403-TIPS where you will remain anonymous. You can also submit a tip online at www.gccsTIPS.com. or P3 Tips App. Information leading to an arrest and indictment in this case could earn up to a $15,000.000 cash reward.